Aargh...get me down from here! 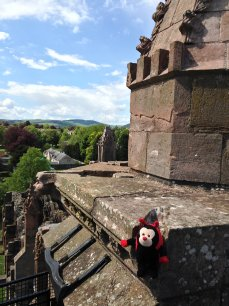 TTB visits the top of Melrose Abbey. The heart of Robert the Bruce, once King of Scotland, is buried at Melrose Abbey. The rest of him lies in Dunfermline Abbey in Fife. Melrose is home to Scotland’s first Teddy Bear Museum. Melrose is the birthplace of Scotland’s famous Rugby Sevens competition, which is contested every year.